John Plotnik is one of those great musicians who plays all the required instruments for bluegrass. If the band needs a banjo player, “no problem.” Guitar? “no problem!” Dobro? “also no problem!” Comes in handy. John was born in Westchester, California, near the beach. John, like many other banjo players, became bitten by the banjo bug after he heard Dueling Banjos. His sweet mom bought him one of those Sears banjos. How many banjo players started on a Sears, a Stella or a Kay? As John said, “Dueling Banjos cracked his head open”. John’s brother played guitar and his sister played piano. John and his brother would jam in the living room, giving John a chance to practice his banjo licks. Finally, John found his way to get banjo lessons from Bill Knopf. Bill got John to enter some contests and he won a few of them; his most notable win was the Topanga Banjo Fiddle Contest. Then he started playing with some other fellas who were called Foxfire.They played a lot of years together, even traveling all the way north to the Grass Valley Father’s Day Festival. Somewhere along the line he met Walden Dahl and they both went off to China. China? Sure, bluegrass is very popular in the Orient; the instruments sound very similar. Then they moved on to Taiwan and Disneyland in Tokyo. After about nine years in the Orient they came back to the states and started playing at Disneyland in Anaheim, California. People who live in Los Angeles know that this is the best bluegrass job in town; playing bluegrass, getting paid AND getting health insurance! People like Steve Martin started there. That lasted about ten years. Then bluegrass moved to Knott’s Berry Farm and John went along, bringing his banjo, guitar, and dobro. John has a lovely wife named Anna; together they have a son named Leo, who plays Little League baseball. Anna will tell you, these boys are die hard Dodger fans; or as John said, “They bleed Dodger Blue!” Anna really likes Chase Utley. Like most bluegrass players, John also plays with a few other bands, except on Mondays when he’s with The Brombies. He also plays on many documentary music scores, TV shows, movies, cartoons, recording artists’ albums; whatever they need, he’s the guy to call. OH! by the way, John met his wife when he was playing banjo on a gig and she came up and asked him if he gave banjo lessons. Isn’t that a banjo players dream? To marry a gal who plays the banjo? She’ll never complain when he’s practicing. John has been playing guitar with The Brombies for about five years now. If Patrick is out of town, then John plays banjo and dobro. How lucky could we get?! We call him “Smilin’ John”. 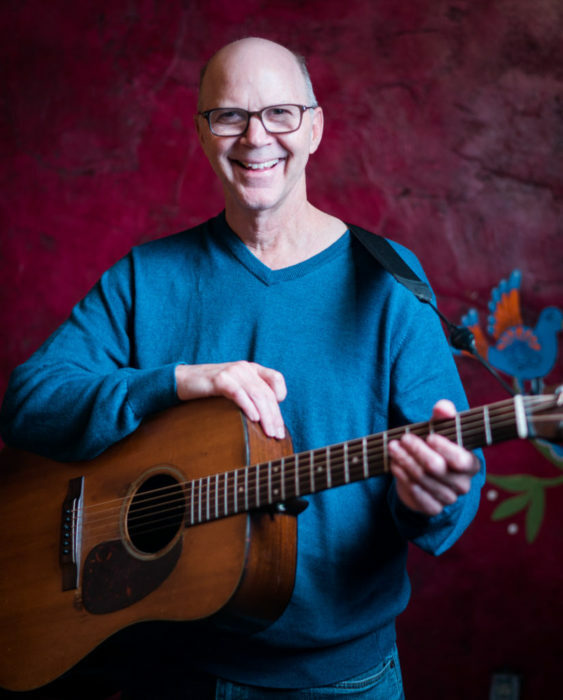 His energy and ever-smiling face are as much of an asset to the band as his excellent musicianship on the guitar, banjo, and dobro. HEY, he sings too! The band is very glad to have John as part of the Brombies herd.